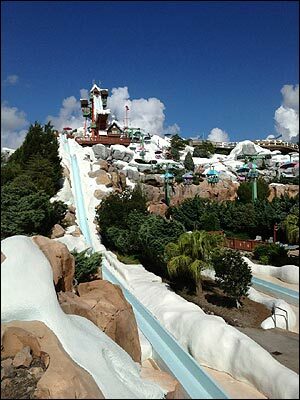 The Florida heat/humidity and water parks are a natural match. Nothing beats the heat like a dip in the water. From the earliest days of Walt Disney World, Disney Imagineers and planners realized this. When River Country's imaginative water park opened in the 1970s, it was one of the first of it's kind in the country. 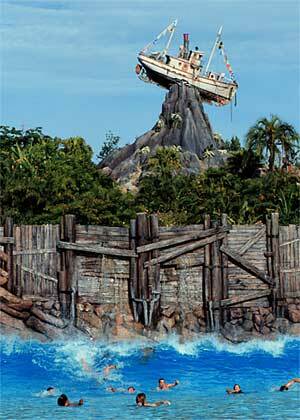 Disney has since closed it's original themed water park. The successors to River Country, Blizzard Beach and Typhoon Lagoon, have taken the ordinary and turned it into the extraordinary. Who would have thought Florida would see "snow" year round? Admission can be purchased separately or as part of a pass. Check INTERCOT's Park Passes section for more information or discuss the water parks in Nightlife, Shopping and Water Parks section of the INTERCOT Discussion Boards.